And so we come to the end of the current ( and last ) PastMastery competition. ONLY Twelve people ( out of thirty five ) who entered came up with the right answer. And this is where they found it, on my blog. 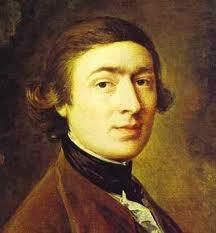 The answer is…..Thomas Peartree, the half a figure designed for the top of a wall by Thomas Gainsborough! Many of you thought that the Lullingstone Sweeper was the right answer. But she is likely to be Flemish…remember? And the legend attached to her that she was painted in this country by Van Dyck is very unlikely to be true. Others thought that some of the Girl Peelers ( ladies peeling apples ) were English. Yes….they might be. 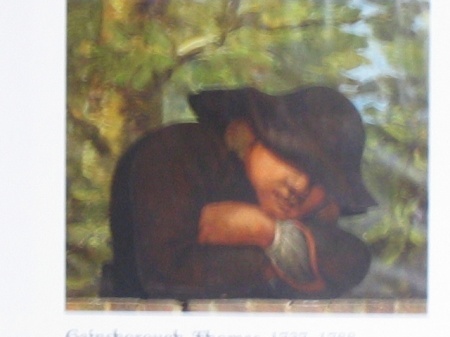 But we can prove without a shadow of a doubt that Thomas Peartree is ENGLISH because we have documentary evidence that Gainsborough, for a start painted it and that it was seen shortly afterwards and was commented on. Have a read of the blog post to see what I mean. the name of the only absolutely proven, known ENGLISH historic dummy board? Because I used almost the same formula in my last words about Thomas Peartree in Make mine a Half. The only absolutely pedigree, absolutely beyond question, proven and native ENGLISH dummy board…is sadly, only a half a one! Thomas Peartree on his wall. Don’t you think too, that there is rather a large clue in the prize I am giving away? And who got it right and had their name drawn out of the hat? CONGRATULATIONS! Jill Rothwell from Bradford in the U.K.! 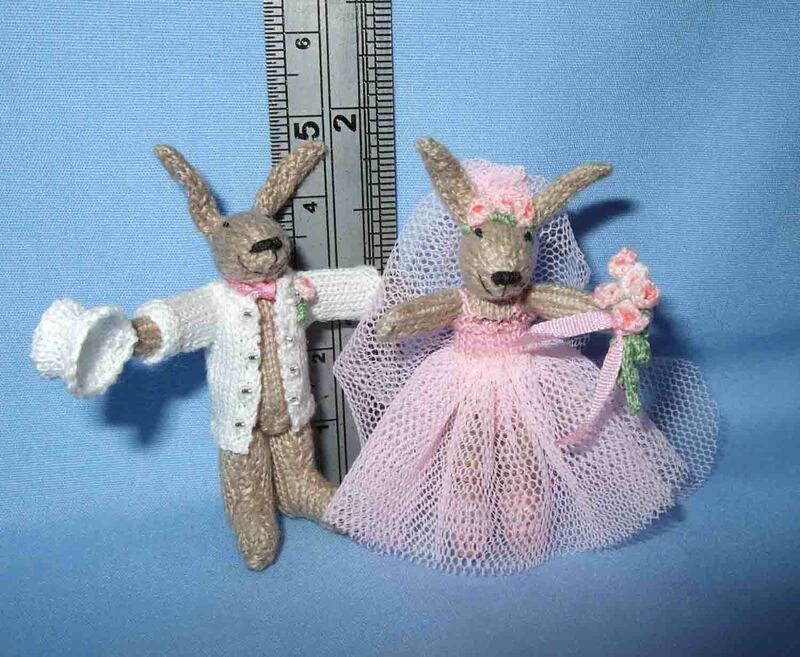 Here is a sample of the sort of miniatures that Jill produces. 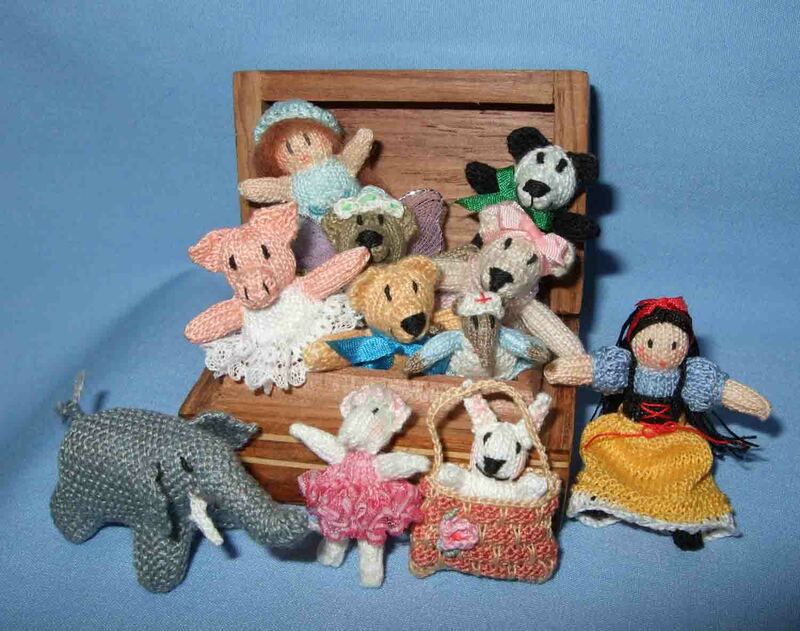 to ask her to knit you a jumper for your Granny…..unless your Granny is Thumbelina!! 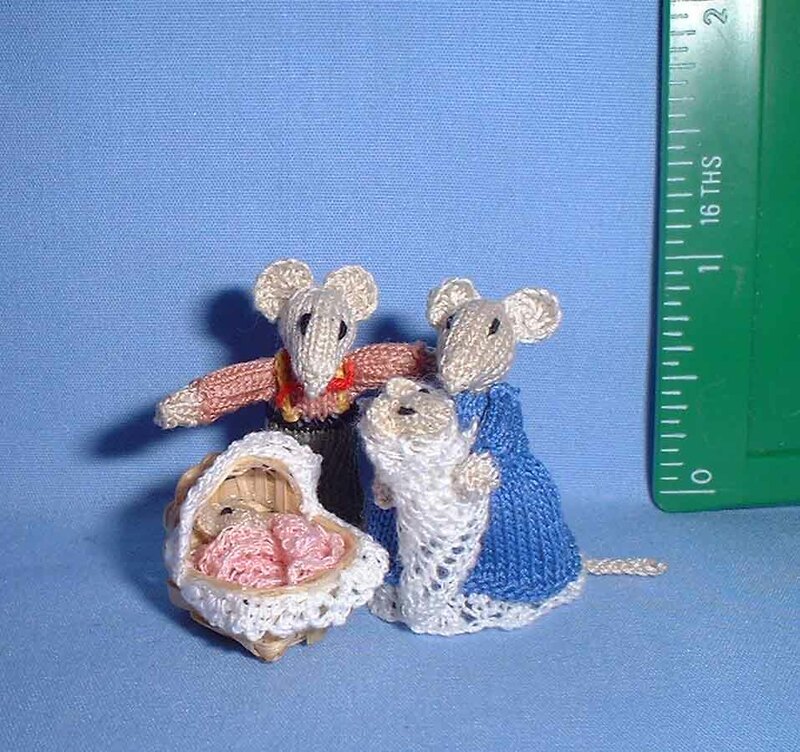 So sweet..a little mouse family, wonderfully knitted. All that remains of this topic, is to tell you, that in my next post ( I promise not to keep you in suspense )I will list which figures were not chosen by our winner and are then consequently, FOR SALE at terribly reduced prices and which figures I still have left after my sale at KDF. MEANWHILE…. 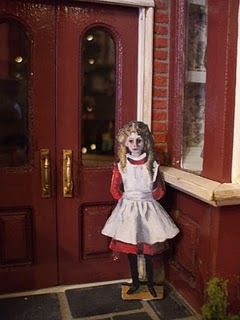 do take a look at Diary of an Edwardian Toyshop, my friend Julie’s blog. She came to the show at Kensington Town Hall and bought a few little bibelots for her Toyshop. The little PastMastery dummy board Frances Darley Bolt, in the doorway of Julie's shop. The little dummy board of the girl with a white pinafore, as I call her, is one which has quite a good provenance. She is a very good and well contained shape for a dummy board, is a life-sized figure and is at present displayed in the privately owned Shelburne Museum in Vermont U.S.A., part of the Darley-Bolt bequest. It has been very simply painted in oils on canvas mounted on a board and it may even have been cut out of an earlier painting -a practice well established in the 19th century. It shows a pretty young girl in Edwardian dress and is undoubtedly a portrait figure. Influenced by the Impressionist fashion of the early twentieth century, the artist has sketchily painted the ruffled collar of the girl’s dress and the stiff linen of her apron using visible brush strokes, laying the white paint on thickly in places where the light strikes the folds. For once, we know who the girl is. She is the youngest daughter of the American Industrialist Mr. Darley Bolt and was no doubt copied from the painting by Singer Sargent. The above of course is a miniature version of the real thing. 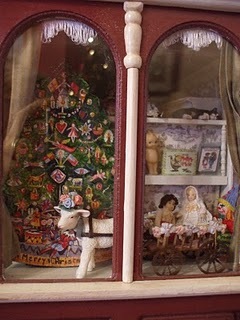 IN the window of Julie’s toyshop, just behind the wonderful lamb pulling a cart, is the Christmas Tree dummy board. You have ALL seen this one before and quite recently in. I’ve said it before but I shall, I’m sorry, say it again….This is a 19th century dummy board of a Christmas tree, standing four feet high. ON it we see all the usual paraphernalia we would expect on a tree of this age. Little bells, wrapped sweets, cones, dolls, jesters or punches with the hump; fruit, stars, candles ( real of course ), wonderful pull along animals and the ubiquitous bauble. It was made at the end of the 19th century in Nuremburg, in Germany’s Bavarian region for display in chocolate and confectioners shops. They would slide them into the window amongst all the goodies that the shop had to offer; gorgeous cakes and pastries, delicately decorated chocolate boxes and shaped edible creations in the form of angels, bells and snow topped trees. They would have competitions to see who could win the prize for the most beautifully decorated window. I think this window would win prizes! This entry was posted on 12/12/2010 at 12:53 pm and is filed under Uncategorized. You can follow any responses to this entry through the RSS 2.0 feed. You can leave a response, or trackback from your own site.